For FREEDOM or a Martyr's Grave. 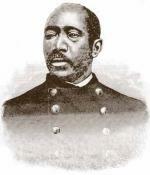 Martin R. Delany, circa 1865. By the time the Liberator published this poem written by Martin R. Delany on May 14, 1852, he had already become convinced that white Americans would never end the institution of slavery nor grant African Americans constitutional rights. Later that year, Delany published The Condition, Elevation, Emigration and Destiny of the Colored People of the United States, the first book-length call for African Americans to leave the United States and find new homes abroad. Often referred to as the "Father of Black Nationalism," Delany would move to Canada, then return to the United States during the Civil War to become the highest-ranking African-American officer of the war. 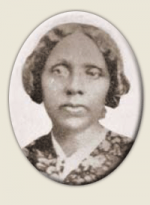 Catherine A. R. Delany, circa 1870. On May 6, 1812, Delany was born into one of eleven free black families living in Charles Town, Virginia (now West Virginia). When he was ten, the family fled to Chambersburg, Pennsylvania, to escape charges brought against his mother for teaching her children to read. While in Chambersburg, Delany attended school and studied the history of his race and of civilization. In 1831, Delany moved to Pittsburgh, where he became active in an already thriving free-black community. There, he joined the Pittsburgh Anti-Slavery Society and aided fugitive slaves through the Philanthropic Society. He also studied medicine and established a cupping and leeching practice—that is, bleeding patients in accordance with standard medical practice of the day. In 1838, the Pennsylvania Supreme Court stripped black Pennsylvanians of their right to vote. Three years later, Delany attended the Convention of the Colored Freemen of Pennsylvania, which passed a resolution calling for the creation of a newspaper controlled by African Americans and devoted to African-American issues. After two years of waiting for the paper to materialize, Delany took the initiative and began publishing The Mystery in Pittsburgh in 1843. 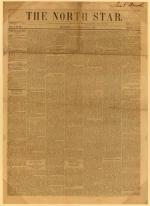 Front page of The North Star, June 2, 1848. In The Mystery—the first African-American newspaper published west of the Allegheny Mountains— Delany stressed the importance of black pride and called for the establishment of black schools and churches. 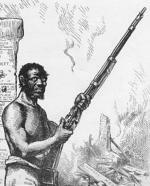 He also used his connections and the newspaper to protect fugitive slaves and free blacks from slave catchers. In 1848, he ceased publication of The Mystery to collaborate with Frederick Douglass on the North Star, a new black newspaper out of Rochester, New York, that soon became the most important black paper in the country. As coeditors, Douglass and Delany emphasized the necessity for African Americans to raise themselves socially and economically, and hoped the North Star would unite abolitionist movements around the country. Despite the enthusiastic start to their partnership, however, their relationship soon soured. After leaving the North Star in June 1849, Delany returned to Pittsburgh where his views on the future of African Americans in the United States soon became more radical. After passage of the Fugitive Slave Act in 1850, Delany entered Harvard Medical School, but soon left after white students protested, arguing "that we have no objection to the education and elevation of blacks but do decidedly remonstrate against their presence in College with us." His indignation over his expulsion and the political climate of 1850 led Delany to conclude that African Americans’ only solution to slavery and racism was to leave the country. Previously, no important black American had supported the goals of the American Colonization Society, founded in 1816 by prominent white Americans to send blacks to Africa. In 1852, Delany published The Condition, Elevation, Emigration and Destiny of the Colored People of the United States, the first book-length defense of African-American emigration. In it, Delany described the terrible condition of African Americans in the United States and laid out his plan for racial separation. As sectional tensions reached a fever point and the nation exploded into open warfare between Free Soilers and proslavery southerners in Bloody Kansas, emigration—long abhorred by African-American leaders—became more and more attractive. In 1854, delegates from twelve states attended the first National Emigration Convention of Colored People. Acting as president of the National Board of Commissioners established at the convention, Delany presented a powerful speech on "The Political Destiny of the Colored Race on the American Continent" in which he detailed the worsening lives of blacks in the United States and advocating emigration to Africa. In 1856, Delany moved to Canada, where he continued his plans for emigration. A resolution passed at the third National Emigration Convention in response to the debate over viable locations for colonization, sent Delany in May 1859 to Yoruba (in present-day Nigeria) to investigate the Niger Valley as a potential colony. After eighteen months abroad, he returned to Canada and in 1861 published The Official Report of the Niger Valley Exploring Party, which included a description of the conditions of western Africa and information to assist future immigrants in settlement. Delany then recruited volunteers and raised funds for the new colony. "The Result of the Fifteenth Amendment," commemorative print, 1870. The plan, however, fell apart after the outbreak of the Civil War and President Lincoln’s Emancipation Proclamation. 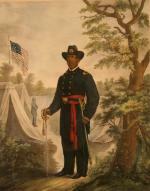 In 1864, Delany relocated to Wilberforce, Ohio, where he campaigned for the recruitment of African-American soldiers and officers. The first African American to receive a commission as major, Delany became the highest-ranking black officer in the Civil War. At the conclusion of the war, Delany joined the Freedmen’s Bureau in South Carolina as a customhouse inspector. After the dissolution of the bureau, he supported the Democrat Wade Hampton, a former Confederate general in his successful 1876 campaign for governor, then served as a trial justice (judge) in Charleston until the Democrats removed all African Americans from public office. Following the infamous Compromise of 1877, which gave Republican Rutherford B. Hayes the presidency in exchange for the official end of Reconstruction, Delany again became pessimistic about the future of African Americans in the United States. After delivering a series of lectures on emigration in 1878, he joined the Liberian Exodus Joint-Stock Steamship Company, which before it went bankrupt in 1879, sent a shipload of emigrants from South Carolina to Liberia. The same year, Delany published his last major work, Principia of Ethnology: The Origin of Races and Color, in which he extolled the virtues of the black race and their contributions to civilization. Unemployed and in need of a job, Delany unsuccessfully petitioned three successive Republican presidents for a federal appointment, hoping to finance his own emigration to Africa. He remained in South Carolina, however, struggling to make a living. In 1884, he returned to his family in Oberlin, Ohio, and died a few months later, on January 24, 1885, at the age of seventy-three. Delany never succeeded in establishing a homeland for black Americans in Africa, but his fiery rhetoric, courage, and belief in the greatness of the black race laid the foundation for future black nationalists, including Marcus Garvey and Malcolm X.
Cyril E. Griffith, The African Dream: Martin R. Delany and the Emergence of Pan-African Thought (University Park: Pennsylvania State University Press), 1975. Robert S. Levine, Martin Delany, Frederick Douglass, and the Politics of Representative Identity (Chapel Hill: University of North Carolina Press), 1997. Victor Ullman, Martin Delany: The Beginnings of Black Nationalism (Boston, MA: Beacon Press), 1971.